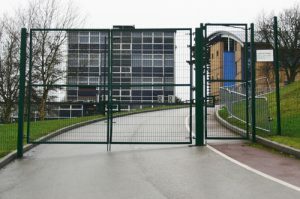 Our range of hinged entrance gates are highly durable and can be used in a variety of applications including schools and industrial sites. Hinged entrance steel gates up to 8 metres per gate leaf to match each type of fence including steel fencing of the types: palisade, mesh panel, balustrade etc. Suitable for a variety of applications including schools, works premises and secure compounds. These hinged entrance steel gates can have automated and remote control openers added, we provide these hinged entrance steel gates all over the UK. For more information about Fengate Manufacturing Ltd and to receive a competitive quotation for your business, please CLICK HERE to contact us. Fengate Manufacturing Limited is a family owned business with more than 20 years of experience in designing, manufacturing and installing high quality fencing and gates throughout the UK.